lifesaver. Wheelan strips away the arcane and technical details and focuses on the underlying intuition that drives statistical analysis. 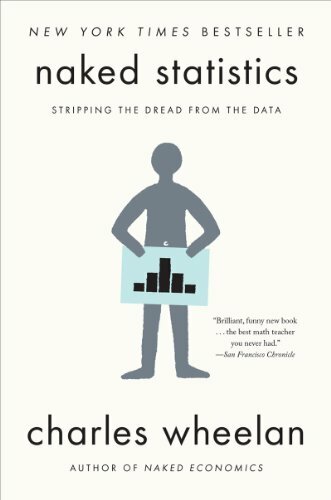 He clarifies key concepts such as inference, correlation, and regression analysis, reveals how biased or careless parties can manipulate or misrepresent data, and shows us how brilliant and creative researchers are exploiting the valuable data from natural experiments to tackle thorny questions. And in Wheelan's trademark style, there's not a dull page in sight. You'll encounter clever Schlitz Beer marketers leveraging basic probability, an International Sausage Festival illuminating the tenets of the central limit theorem, and a head-scratching choice from the famous game show Let's Make a Deal-and you'll come away with insights each time. With the wit, accessibility, and sheer fun that turned Naked Economics into a bestseller, Wheelan defies the odds yet again by bringing another essential, formerly unglamorous discipline to life. Charles Wheelan is the author of the internationally best-selling Naked Economics and Naked Statistics and a former correspondent for The Economist, and founder of The Centrist Party. He teaches public policy and economics at Dartmouth College and lives in Hanover, New Hampshire, with his family.